Sammy is a 7 year old King Cavalier. When he came into our rescue he needed to be groomed and vetted. 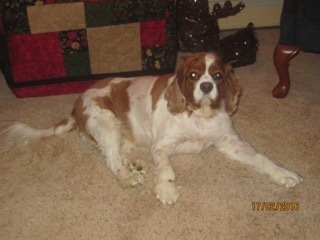 Sammy is a very sweet boy, is house trained, loves to go for rides, and learning how to play with toys and dogs. His only fault is that he snores quite loudly. Sammy is losing weight and he now has a waist.